According to a new market report Master Recharge API Market, published by Transparency Market Research, the global master recharge API market is expected to reach US$ 16,159.3 Mn by 2026, expanding at a CAGR of 5.2% from 2018 to 2026. According to the report, the global market will continue to be influenced by a range of macroeconomic and industry-specific factors. Asia Pacific (APAC) will continue to be at the forefront of global demand, with the market in the region growing at above 6% through 2026. Recharge API commercial applications across retail and ecommerce are anticipated to significantly influence the global master recharge API market growth across the APAC region. Globally, the number of smartphone users is booming with the trend shifting toward a single user having more than one smartphone or multi-SIM connections. Further, online payment technologies and platforms are proliferating into the end-use market with a remarkable growth rate. The global master recharge API market is expected to witness a positive growth outlook due to this rise in customer base and number of transactions per customer. The trend is further strengthened by growing emphasis on digital payments and proliferation of service networks by vendors for last mile connectivity. Recharge API developing companies are enhancing their offerings by introducing advanced recharge platforms and secure and efficient payment modes. Moreover, recharge providers or utility billing, hotel, bus, and air travel booking service providing companies are open to partnerships with API developers to tap a wider customer base with services delivered globally. Prepaid mobile recharge services in the global market is experiencing significant growth. Moreover, over the years, utility billing and DTH recharge services are switching from offline channels to online platforms and this trend is set to drive demand for master recharge API. Furthermore, increased presence of a number of telecom service providers across regions has led to subsequent rise in number of recharge service providers, retailers/resellers, distributors, white label companies, and API integrators across the world. This is likely to supplement the market growth during the forecast period. Rising penetration of internet as well as significant investments in telecommunication infrastructures and digitization across countries such as India, South Africa, Brazil, and Malaysia is anticipated to offer prominent opportunities for master recharge API providers in the near-term. The global master recharge API market is broadly segmented by services into prepaid mobile recharge, postpaid mobile recharge, data card, DTH, electricity, insurance, and others (Gas and other utility services). The research study includes master recharge API market analysis by regions segmented into North America, Europe, Asia Pacific, Middle East & Africa, and South America. According to the research study, the prepaid mobile segment of the market held the maximum market share and is anticipated to remain dominant over the forecast period. The DTH service segment is anticipated to contribute largest revenue share after prepaid mobile recharge services. Additionally, DTH segment is forecast to experience highest CAGR during the period 2018 – 2026. Overall, most of the segments are expected to see steady and healthy growth in the near future. However, security concerns and issues such as cyber security threats, malware and other harmful software applications are the major barriers to the growth of the master API recharge market. Asia Pacific (APAC) held the largest revenue share of the master recharge API market in 2016 and is anticipated to grow at a CAGR of 6.4% during the forecast period. 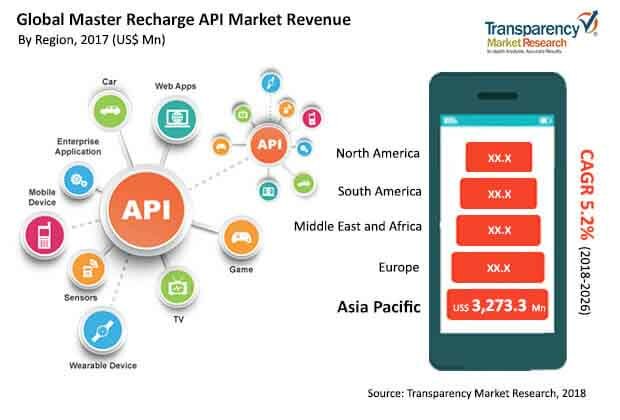 Analyzing the Asia Pacific master recharge API market at country level, it is seen that China held majority of revenue share of the Asia Pacific master recharge API market followed by India in 2016. However, in terms of growth rate, India is anticipated to show healthy CAGR over the forecast period. The research study includes profiles of leading companies operating in the global master recharge API market. Profiles of market players highlights company business overview, broad financial overview, business strategies, and recent developments. Some of the key players in the master recharge API market as profiled in the study are Ezetop, Cyberplat, Euronet Worldwid, Jolo, Crowdfinch, Axis Softech Private Limited, Recharge Handa (Handa Enterprises), Indian Web Technologies (P) Ltd. (IWT), Pixyrs Softech, Pointersoft Technologies Pvt. Ltd., MyRecharge, Xtracare IT Solution, LBS Software, and Cyrus Technoedge Solutions Pvt. Ltd. among others.